Went for my second ride with the London Brompton Club today. Was a fairly long ride, the Thames Triple Chase - 25 miles or so from Central London out to Stratford, West Ham and then down across the river on the Woolwich ferry, down to the O2 and across on the cable car and then heading back towards London before crossing over finally into the Greenwich foot tunnel. Well attended ride! 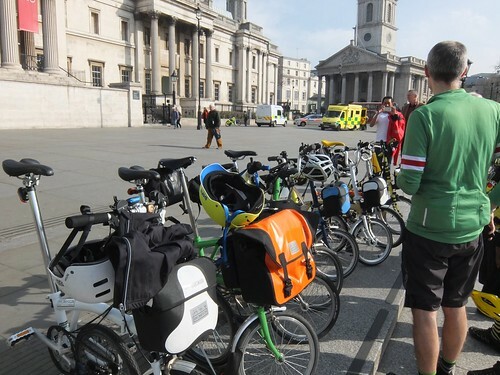 I believe there were thirty odd Bromptons at one point. 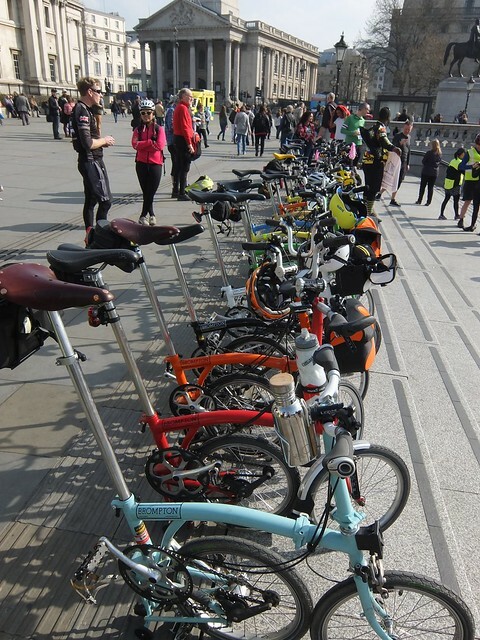 The start was quite good fun - we arranged the bikes along the top of the steps in Trafalgar Square. Turns out there were so many of us, that tourists started taking pictures of us! Anyhow, got going and with a few minor diversions thanks to some roadworks down by Cheapside and Poultry, we headed out to the canal paths. 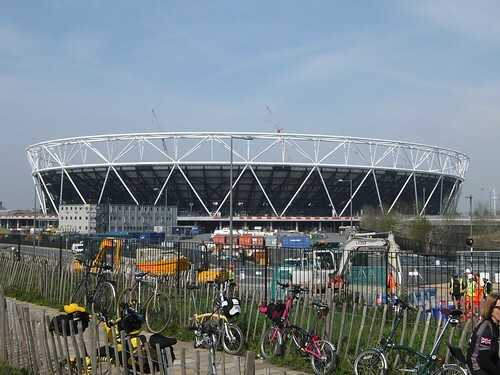 Once we made it to Stratford, we stopped for some tea and cake at the viewtube cafe, which has some fantastic views of the Olympic Park. Or at least will when the contractors disappear! 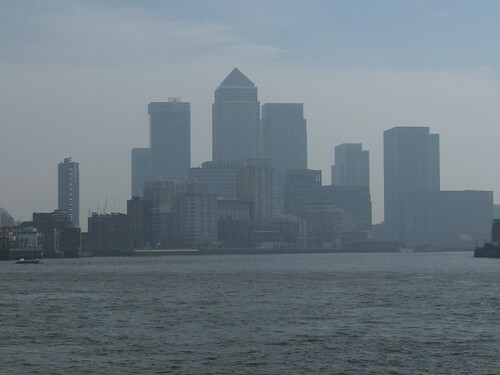 Shortly before passing by some of the projects I’ve worked on in Stratford and my own first project that I managed with my company on Roman Road, we made our way into Woolwich and waited for the Woolwich ferry. 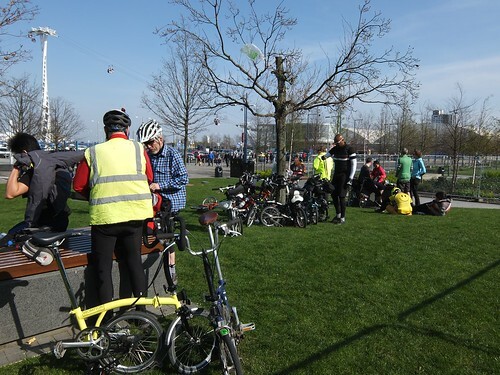 Seeing so many Bromptons stream off the ferry must have been a sight to see for those on the other side! To be fair, seeing so many Bromptons stream on to the ferry must have proved amusing! 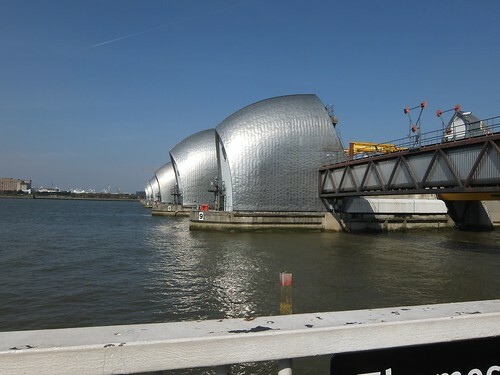 Once on the other side of the river, we visited one of the most interesting civil engineering projects for London - the Thames barrier. It was the first time I’d been up close and personal with it and I have to say I was fairly impressed. I wouldn’t mind visiting it again for a more in depth look but that might have to wait as I’ve a list of other things to crack on with! We ended up stopping for lunch at the O2. This did lead to my first interesting “argument” with a Brompton. I walked into the O2 with my bike, wheeling it along trying to find myself a loo for a quick loo break. I was stopped and told bikes weren’t allowed within the O2. Oh, I said, what about now? (and proceeded to fold it up). The security guard seemed a bit flummoxed to be fair and had to check with a colleague! As long as I could carry it, it was fine apparently! At this point, I keep forgetting I’ve got the Eazy wheels on the bike! However, it was good to be able to carry it around and not have to lock it up - after all, I don’t carry a lock with my Brompton at all. I have to lock it up in secure bike parking at work and that’s where my lock stays. We then proceeded to cross back over the Thames using the Emirates Airline, managing five Brompton riders and Bromptons per pod. 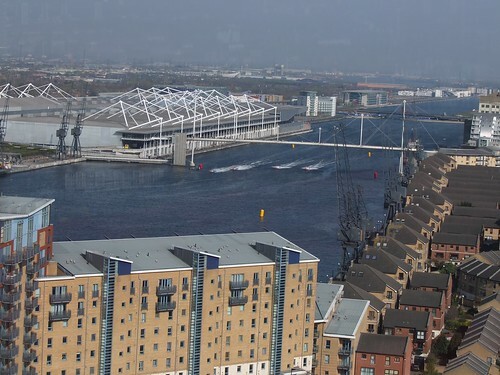 We managed to catch the end of a boat race alongside the side of the ExCeL centre. There was some form of festival or something going on there with many jet skis and other water based machines crowded one end of the basin. Finally, we reached the point where we then could see our final destination - the Greenwich Hospital. 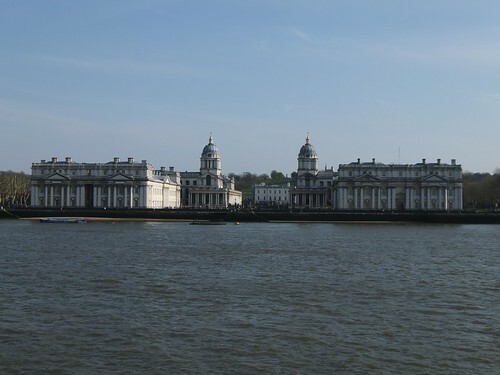 Another fantastic piece of Christopher Wren architecture, the hospital marked the end point of our ride, alongside the nearby Cutty Sark. 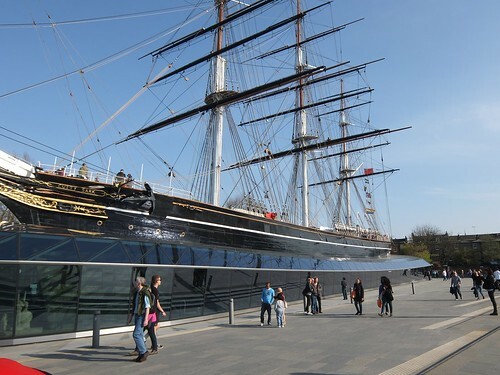 At this point, we all stopped for a photo in front of the bow of the Cutty Sark before all heading our separate ways. A group stayed for drinks but I felt it more prudent to head back into London along with a small group of riders. Pace was a bit quicker heading back with less of us and was good slog back into London. Leaving most at London Bridge station and then dropping the rest at the other end of London Bridge, I made a quick detour via Holborn/Covent Garden to nip into the Brompton Junction to pick up a T-Bag and then headed back to Kings Cross to complete the day. 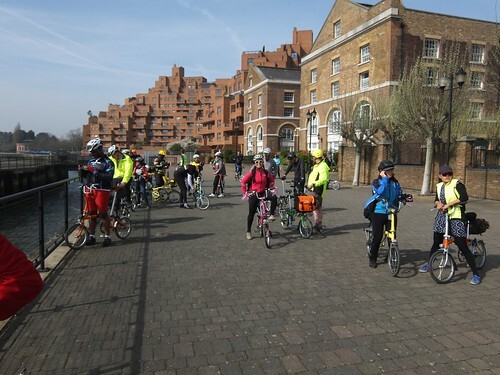 Overall was a really great day and I was surprised at the number of cycle paths that we were able to cover on the route - it was very rare that we were actually on the road after getting out of the City of London! We couldn’t have really asked for better weather. This was my first long distance ride on the Brompton - well, a total of 60Km for the day, so maybe not the longest distance I’ve done overall but it was a good time out on the bike (arrived in London at 9 and got home about 6 so we’re talking a full work day!). I think there were some learning points for me for the ride. Firstly, hydration. I know I should hydrate a lot when exercising but the issue I came up against was where to mount drinks. I ended up with a bottle of water within my mini O bag but this wasn’t ideal as I couldn’t drink on the way round, only when stopped. A number of riders have velcro mounted or other mounted bottle holders - however, these might affect the fold which makes them harder for me to use if I have use the trains to get into London. I think I’ve got two options really - a Camelbak style hydration bladder, similar that I would use for mountain biking or a triathalon style bottle cage. 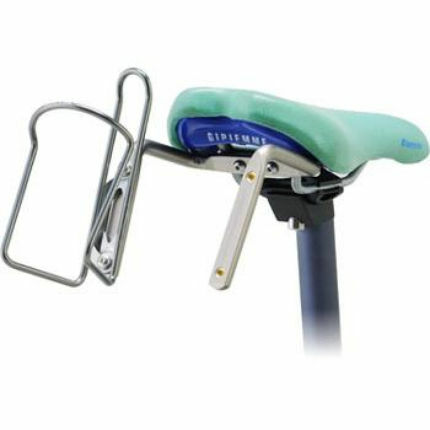 The triathalon bottle extension, shown above would allow me to use all my existing bottles on the bike and doesn’t look like it would affect the folding of the Brompton which is good. However, the Brompton is less stable than the bikes I’m previously used to and perhaps reaching around behind me when moving might prove problematic. 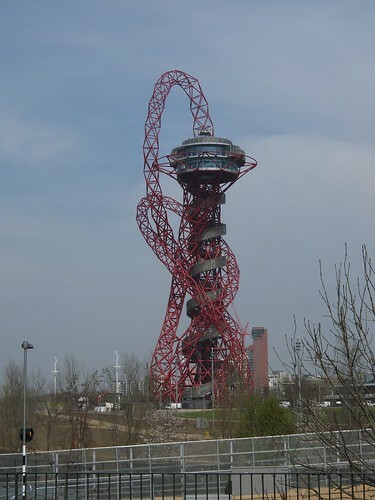 I’m more tempted to head down the Camelbak, even though at the minute I’m enjoying cycling without a backpack on. I think this is winning out as I should be able to use this for different activities as well, other than cycling. It also gives a bit more flexibility for carrying stuff - I struggled yesterday to fit my jacket into my Mini O bag. Second learning point - make sure that you pump your tyres up before hand! I got to Kings Cross early to pump my tyres up using the pump we keep in the office. I was disappointed that it was poor and spent today finding myself a new one to keep at home (I settled for a Topeak Joe Blow 2). This performed far better than the office pump and be making sure to use it regularly! Overall it was a fantastic ride and I look forward to some more in the future - next week sees me taking part in the London Classic with a few of the LBC.